Review by de profundis on 3/30/2012. this is a five star map. we have just won a place in a tourney final on this map. 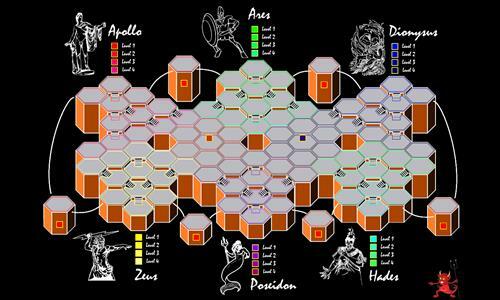 http://WarLight.net/MultiPlayer.aspx?GameID=2429518 as it was proposed in this game, I request a change in one hex's name to "Tyche" as a tribute to the ancient diety of Luck, that has helped us so much, so far. :-) I will consider that for the next update. Review by Craig Hepler on 9/1/2013. I liked the 6 player start. Review by rgk on 5/9/2017. I play Warlight daily and this is by far one of the best and most interesting maps I have ever played. The position and value of each bonus is perfect. Having some territories not attached to a bonus is unconventional, but it works really well as it makes each movement feel deliberate rather than just expanding like a blob without a shape. Here there are dangerous hotspots that still have ways around to increase the tactical possibilities. We play this in 2v2, each player at a corner. Then players can decide to play it safe and go to the middle by land, or take a risk to conquer the middle positions faster with the -3 tiles. There is a lot of strategy around taking/denying the bonus 8 areas. Review by Nick on 6/26/2012. Roman Gods, and Latin in the names of things. It was good. I fought some not so smart AIs. They would think: this AI has this -4 space I WANT that I HAVE to get that so I can get LESS troops per round. Review by G_GR on 12/20/2014. Review by Berserk on 1/29/2013.